"...If I were a bird I would fly about the earth seeking the successive autumns." The crunch of leaves underfoot, an etching of frost on the grass, cinnamon-y apple crisp wafting once more out of the oven. . . Autumn is so short, it's hard to fit everything in! So you don't forget anything, here's a to-do list to check off by Thanksgiving -- some things whimsical, some things practical, all indubitably autumnal. 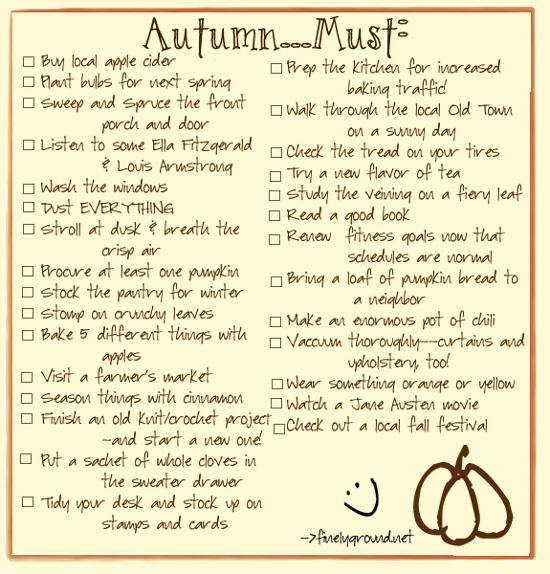 What's on your Fall Checklist? What? No way! :) Well, be sure to try out some Ella Fitzgerald, anyway. Love her voice. He just sounds so raspy that I can't appreciate the music. It's my fault, not his. :P I'll try out Ella soon! I love this idea! I hate it when a season (especially my favorite!) ends and I realize I forgot one of my favorite things. And I suppose the sensible tasks are nice to mix in with the fun ones. :) I'm going to make a list right now! !